A feature module is an organizational best practice, as opposed to a concept of the core Angular API. A feature module delivers a cohesive set of functionality focused on a specific application need such as a user workflow, routing, or forms. While you can do everything within the root module, feature modules help you partition the app into focused areas. A feature module collaborates with the root module and with other modules through the services it provides and the components, directives, and pipes that it shares. While the following guidelines describe the use of each type and their typical characteristics, in real world apps, you may see hybrids. Domain feature modules deliver a user experience dedicated to a particular application domain like editing a customer or placing an order. They typically have a top component that acts as the feature root and private, supporting sub-components descend from it. Domain feature modules consist mostly of declarations. Only the top component is exported. Domain feature modules rarely have providers. When they do, the lifetime of the provided services should be the same as the lifetime of the module. Domain feature modules are typically imported exactly once by a larger feature module. They might be imported by the root AppModule of a small application that lacks routing. Routed feature modules are domain feature modules whose top components are the targets of router navigation routes. All lazy-loaded modules are routed feature modules by definition. Routed feature modules don’t export anything because their components never appear in the template of an external component. A lazy-loaded routed feature module should not be imported by any module. Doing so would trigger an eager load, defeating the purpose of lazy loading.That means you won’t see them mentioned among the AppModule imports. An eager loaded routed feature module must be imported by another module so that the compiler learns about its components. Routed feature modules rarely have providers for reasons explained in Lazy Loading Feature Modules. When they do, the lifetime of the provided services should be the same as the lifetime of the module. Don’t provide application-wide singleton services in a routed feature module or in a module that the routed module imports. A routing module provides routing configuration for another module and separates routing concerns from its companion module. Adds router configuration to the module’s imports. Adds guard and resolver service providers to the module’s providers. The name of the routing module should parallel the name of its companion module, using the suffix “Routing”. For example, FooModule in foo.module.ts has a routing module named FooRoutingModule in foo-routing.module.ts. If the companion module is the root AppModule, the AppRoutingModule adds router configuration to its imports with RouterModule.forRoot(routes). All other routing modules are children that import RouterModule.forChild(routes). A routing module re-exports the RouterModule as a convenience so that components of the companion module have access to router directives such as RouterLink and RouterOutlet. A routing module does not have its own declarations. Components, directives, and pipes are the responsibility of the feature module, not the routing module. A routing module should only be imported by its companion module. Service modules provide utility services such as data access and messaging. Ideally, they consist entirely of providers and have no declarations. 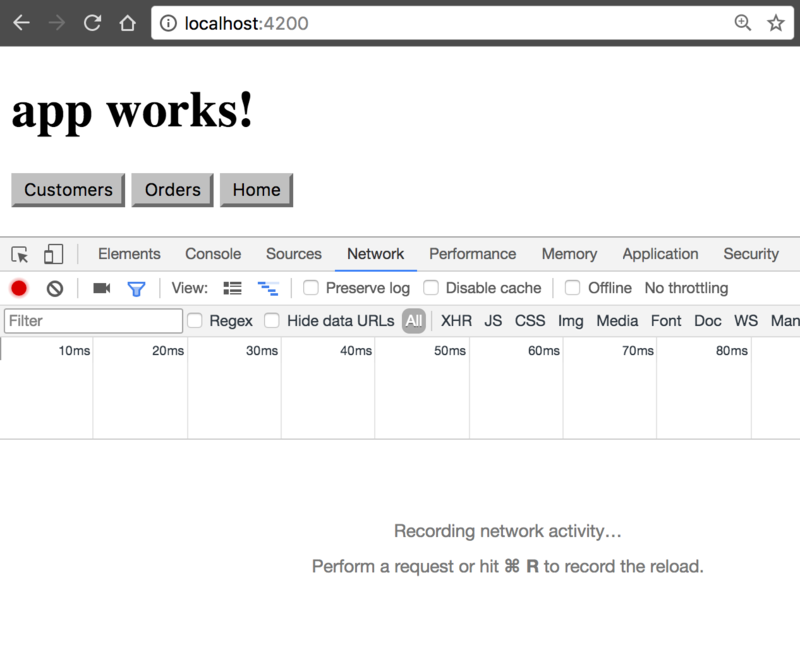 Angular’s HttpClientModule is a good example of a service module. The root AppModule is the only module that should import service modules. A widget module makes components, directives, and pipes available to external modules. Many third-party UI component libraries are widget modules. A widget module should consist entirely of declarations, most of them exported. A widget module should rarely have providers. Import widget modules in any module whose component templates need the widgets. For the final sample app with two lazy loaded modules that this page describes, see the live example / download example. Create the feature module’s routing module. This creates an app called customer-app and the --routing flag generates a file called app-routing.module.ts, which is one of the files you need for setting up lazy loading for your feature module. Navigate into the project by issuing the command cd customer-app. This creates a customers folder with two files inside; CustomersModule and CustomersRoutingModule. CustomersModulewill act as the gatekeeper for anything that concerns customers. CustomersRoutingModule will handle any customer-related routing. This keeps the app’s structure organized as the app grows and allows you to reuse this module while easily keeping its routing intact. This creates a folder inside of customers called customer-list with the four files that make up the component. Just like with the routing module, the CLI imports the CustomerListComponent into the CustomersModule. This makes a new folder called orders containing an OrdersModule and an OrdersRoutingModule. To make the buttons work, you need to configure the routing modules. Each feature module acts as a doorway via the router. In the AppRoutingModule, you configure the routes to the feature modules, in this case OrdersModule and CustomersModule. This way, the router knows to go to the feature module. The feature module then connects the AppRoutingModule to the CustomersRoutingModule or the OrdersRoutingModule. Those routing modules tell the router where to go to load relevant components. The import statements stay the same. The first two paths are the routes to the CustomersModule and the OrdersModulerespectively. Notice that the lazy loading syntax uses loadChildren followed by a string that is the relative path to the module, a hash mark or #, and the module’s class name. Next, take a look at customers.module.ts. If you’re using the CLI and following the steps outlined in this page, you don’t have to do anything here. 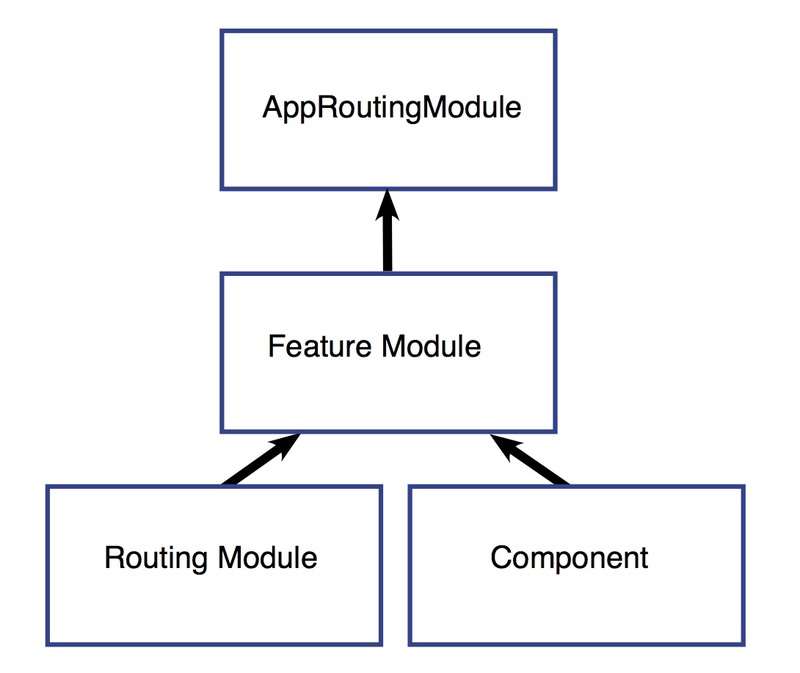 The feature module is like a connector between the AppRoutingModule and the feature routing module. The AppRoutingModule imports the feature module, CustomersModule, and CustomersModule in turn imports the CustomersRoutingModule. The customers.module.ts file imports the CustomersRoutingModule and CustomerListComponent so the CustomersModule class can have access to them. CustomersRoutingModule is then listed in the @NgModule imports array giving CustomersModule access to its own routing module, and CustomerListComponent is in the declarations array, which means CustomerListComponent belongs to the CustomersModule. Notice that the path is set to an empty string. This is because the path in AppRoutingModule is already set to customers, so this route in the CustomersRoutingModule, is already within the customers context. Every route in this routing module is a child route. Now, if you view the app in the browser, the three buttons take you to each module. You can check to see that a module is indeed being lazy loaded with the Chrome developer tools. In Chrome, open the dev tools by pressing Cmd+Option+i on a Mac or Ctrl+Alt+i on a PC and go to the Network Tab. Click on the Orders or Customers button. If you see a chunk appear, you’ve wired everything up properly and the feature module is being lazy loaded. 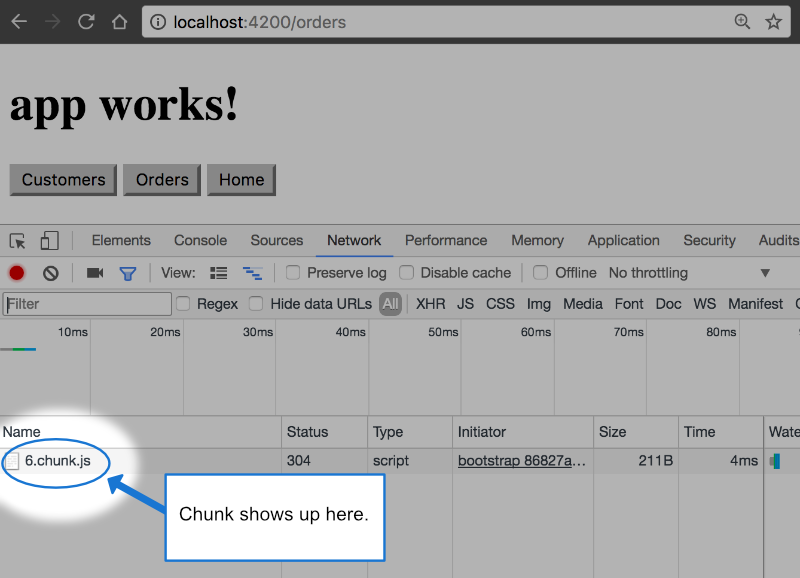 A chunk should appear for Orders and for Customers but will only appear once for each. You might have noticed that the CLI adds RouterModule.forRoot(routes) to the app-routing.module.ts imports array. This lets Angular know that this module, AppRoutingModule, is a routing module and forRoot() specifies that this is the root routing module. It configures all the routes you pass to it, gives you access to the router directives, and registers the RouterService. Use forRoot() in the AppRoutingModule—that is, one time in the app at the root level. The CLI also adds RouterModule.forChild(routes) to feature routing modules. This way, Angular knows that the route list is only responsible for providing additional routes and is intended for feature modules. You can use forChild() in multiple modules. forRoot() contains injector configuration which is global; such as configuring the Router. forChild() has no injector configuration, only directives such as RouterOutlet and RouterLink.